1.1. The Afternoon Express “Fortyfied” ticket (Competition) will be run by Cardova Trading (Pty) Ltd in association with Nik Rabinowitz (Organisers/we/us/our). Entries for the Competition will open at 17h00 on Wednesday, 21 December 2016 and will close at 23h59 on Wednesday, 21 December 2016 (Competition Period). 5.1. We will randomly draw 3 (three) winners (Winners) by means of an automated system within 48 (forty-eight) hours from the closing date of the Competition Period. Late entries will not be considered. 5.2. We will contact the Winner within 2 (two) days from the prize draw on the cell phone numbers from which the entries were sent. If a Winner is not contactable within 2 (two) days from the prize draw, and after we have made at least 3 (three) attempts to contact the Winner, that Winner will forfeit the prize and we shall have the right to select a different Winner on the same conditions except that we shall only be required to make 1 (one) attempt to contact each further Winner drawn. 5.3. The Winner will be required to provide a copy of his/her Identification Document as required in terms of the Consumer Protection Act, 68 of 2008. If the Winner fails to provide a copy of his/her Identification Document within 2 (two) days from being requested to do so, the Winner will forfeit the Prize and shall have no claim against us. 6.1. 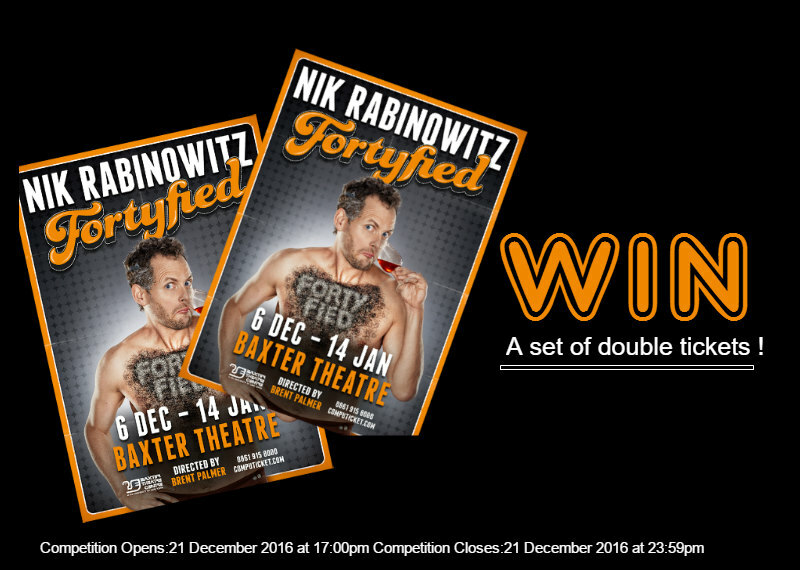 The 3 (three) Winners will each receive 2 (two) tickets (Tickets) to watch “Fortyfied” by Nik Rabinowitz at the Baxter Theatre on 29 December 2016 (Prize). 6.4. We will contact each Winner per telephone to provide details for collection of the Prize. The Tickets will be available for collection at the ticket office at Baxter Theatre on 29 December 2016 and has to be collected by 19h00 sharp. The show starts at 20h30 on 29 December 2016. The Winners will be required to show his/her Identification Document when collecting the Tickets. 6.5. If a Winner is for any reason unable to use a Ticket, we kindly request that he/she notifies us by 12h00 of 29 December 2016, so that the Tickets can be re-allocated.